Multidrug resistance-associated protein-1 (MRP1) protects against oxidative stress and toxic compounds generated by cigarette smoking, which is the main risk factor for chronic obstructive pulmonary disease (COPD). We have previously shown that single nucleotide polymorphisms (SNPs) in MRP1 significantly associate with level of FEV1 in two independent population based cohorts. The aim of our study was to assess the associations of MRP1 SNPs with FEV1 level, MRP1 protein levels and inflammatory markers in bronchial biopsies and sputum of COPD patients. Five SNPs (rs212093, rs4148382, rs504348, rs4781699, rs35621) in MRP1 were genotyped in 110 COPD patients. The effects of MRP1 SNPs were analyzed using linear regression models. One SNP, rs212093 was significantly associated with a higher FEV1 level and less airway wall inflammation. Another SNP, rs4148382 was significantly associated with a lower FEV1 level, higher number of inflammatory cells in induced sputum and with a higher MRP1 protein level in bronchial biopsies. This is the first study linking MRP1 SNPs with lung function and inflammatory markers in COPD patients, suggesting a role of MRP1 SNPs in the severity of COPD in addition to their association with MRP1 protein level in bronchial biopsies. Chronic obstructive pulmonary disease (COPD) is an inflammatory lung disease associated with an influx of neutrophils, macrophages and CD8+ T-lymphocytes in the airways and lung tissue. Smoking generates oxidative stress resulting from an oxidant - antioxidant imbalance, and oxidative stress markers are increased in airspaces, blood and urine of smokers and COPD patients. Oxidative stress can be reduced by members of the ATP-binding cassette (ABC) superfamily of transporters. One such a transporter is multidrug resistance-associated protein-1, MRP1, (official name ABCC1, ABC subfamily C, member 1) that plays an important role in normal lung physiology by protecting against toxic xenobiotics and endogenous metabolites. MRP1 was first detected in small cell lung cancer. It has been shown to be highly expressed in the normal human lung [4, 5] and particularly at the basolateral side of human bronchial epithelial cells. Interestingly, we have previously shown that MRP1 is less expressed in bronchial epithelium of COPD patients compared to healthy subjects. Mrp1/Mdr1a/1b triple knock-out mice had a poor ability for smoke-induced IL-8 production compared with wild type mice, which associated with almost complete absence of inflammatory cells in response to cigarette smoke. An additional study demonstrated that cigarette smoke extract inhibits MRP1 activity in bronchial epithelial cells in vitro. Thus there is a clear role for MRP1 in COPD. A total of 51 single nucleotide polymorphisms (SNPs) with a minor allele frequency (MAF) > 5% are required to tag the entire MRP1 gene in Caucasians. We have shown that two SNPs in MRP1 significantly associate with a lower or higher level of FEV1 in two independent population-based cohorts. Two additional SNPs had a significant effect of the same, negative magnitude on the level or decline of FEV1. One SNP was a significant predictor of COPD in the general population . So far, no study has focused on the relation between MRP1 polymorphisms and the level of lung function, inflammatory markers and MRP1 protein in lung tissue of individuals with established COPD. We had the unique opportunity to do so in a recently finished, two center trial in COPD that amongst others studies inflammatory markers in bronchial biopsies and induced sputum. Furthermore, we assessed whether MRP1 protein levels in bronchial biopsies of COPD patients are associated with MRP1 SNPs. We included 114 patients with COPD who participated in a two-center trial (Groningen Leiden Universities and Corticosteroids in Obstructive Lung Disease; GLUCOLD study). Patient characteristics and methods have been described in detail previously. In brief, all patients had irreversible airflow limitation and chronic respiratory symptoms. Included patients had neither used a course of oral steroids during the previous 3 months, nor maintenance treatment with inhaled or oral steroids during the previous 6 months. They were current or ex-smokers with a smoking history of ≥10 packyears, aged between 45 and 75 years without a history of asthma. The study was approved by the medical ethics committees of the University Medical Centers of Leiden and Groningen. All patients gave their written informed consent. To verify the differences of MRP1 levels in bronchial biopsies between COPD patients and healthy subjects, we included 37 subjects as controls, of which 28 were previously recruited in order to participate in a smoking cessation program. They were symptomatic and asymptomatic smokers according to the ATS-ERS (American Thoracic Society-European Respiratory Society) guidelines  and met the following criteria: 45-75 years of age, >10 pack years of smoking, FEV1/FVC pre and post bronchodilator > 70%, no use of inhaled or oral corticosteroids in the previous 6 months, no sign of atopy, no respiratory tract infections one month prior to the study and none of the participants had any co-morbidity. The remaining 9 subjects were included as controls with an FEV1/FVC pre and post bronchodilator > 70% and FEV1 >80% predicted. We used an additional control group from the general population-based cohort (Doetinchem)  to check for the differences in genotype distributions between COPD patients and general population (Additional file 1). Lung function and reversibility to salbutamol were measured as described previously for COPD patients  and for controls. Sputum induction and processing were performed as described previously  according to a validated technique. Details on biopsy processing, immunohistology and analysis have been published previously. In brief, we collected the two best morphological biopsies out of four paraffin embedded biopsies per patient and used specific antibodies against T lymphocytes (CD3, CD4 and CD8), macrophages (CD68), neutrophil elastase (NE), mast cell tryptase (AA1) and eosinophils (EG2) (Additional file 1). We selected SNPs based on our previous results showing a significant association of 5 MRP1 SNPs (rs212093, rs4148382, rs35621, rs4781699 and rs504348) with the FEV1 level and/or annual FEV1 change in two independent population-based cohorts . The rs504348 SNP results in a significant increase in MRP1 promoter activity in vitro. Genotyping was performed by K-Bioscience (UK) using their patent-protected competitive allele specific PCR system (KASPar). Details on bronchial biopsy collection and processing are described in the data supplement. Four paraffin-embedded biopsies were cut in 4 μm thick sections and haematoxylin/eosin staining was used for evaluation and selection of the best morphological biopsy per subject for analysis (without crush artefacts, large blood clots, or only epithelial scrapings). The staining was performed on one paraffin section of 4 μm per subject with monoclonal antibody MRPr1 for MRP1 (Santa Cruz, California, USA). Details on immunohistochemical staining are described in Additional file 1. Evaluation of different types of epithelium was performed separately (i.e. basal epithelium, squamous metaplasia, intact epithelium). For the current study, intact bronchial epithelium was selected for analysis. MRP1 protein was scored for staining intensity in intact epithelium of bronchial biopsies with a semi quantitative score: 0 = no staining; 1 = weak; 2 = moderate; 3 = strong. MRP1 intensity scores for intact epithelium were available from 80 bronchial biopsies of subjects with COPD and 26 bronchial biopsies of controls. Due to the fact that there were only 3 individuals with no immunohistochemical expression of MRP1, the MRP1 intensity was categorised in 3 groups: 1 = weak staining, 2 = moderate staining and 3 = strong staining. Two observers (S.B. and W.T.) performed all evaluations of bronchial biopsies individually, in a blinded manner. Most sections stained variable for MRP1 in epithelium and parts with the most intense staining were evaluated for scoring. Differences in MRP1 staining intensity between biopsies of COPD patients and controls and according to MRP1 SNPs were analyzed using Chi-square tests. Analyses were performed using SPSS version 16.0 for Windows and values of p < 0.05 (tested 2-sided) were considered statistically significant. The clinical characteristics of COPD patients and controls are presented in Table 1. Clinical characteristics of COPD patients and controls with airway biopsy available. DNA was available from 110 out of 114 COPD patients and from 37 controls. All 5 MRP1 SNPs were in Hardy Weinberg Equilibrium (HWE, p > 0.05) and were not highly correlated with each other (the highest r2 in our population is 0.34) (See figure S1 in Additional file 2). There were no significant differences in genotype distributions between the COPD patients and the general population-based control cohort (Additional file 1). Likewise, there were no significant differences in genotype distributions between the COPD patients and controls (Table 2). Prevalence of MRP1 SNPs in COPD patients and controls. Table 3 shows the number and the percentage of inflammatory cells in bronchial biopsies and induced sputum from the COPD patients. 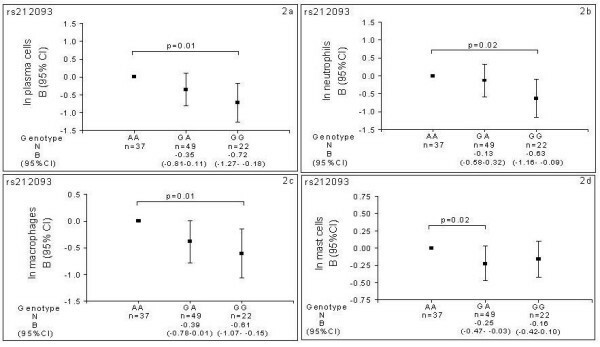 In a general model, individuals who were homozygote mutant (GG) for rs212093 had a significantly higher FEV1 than wild type (AA) individuals, as reflected by a regression coefficient B value (95% CI, confidence interval) of 222 ml (48 ml to 396 ml); p = 0.013. Heterozygote (GA) individuals for rs4148382 had a significantly lower FEV1 than wild type (GG) individuals (-215 ml (-356 ml to -75 ml); p = 0.003). None of the other 3 SNPs (rs504348, rs4781699 and rs35621) was significantly associated with the FEV1 level (Figure 1). Additional adjustment for current smoking status did not change the size or significance of the effect estimates of the genotypes on level of FEV1. Estimated effects of MRP1 genotypes on level of FEV 1 in COPD patients. FEV1 = forced expiratory volume in one second. N= Number of individuals. Squares represent the regression coefficient (B) and vertical bars represent 95% confidence interval (CI). Wild type was set to zero as the reference category. The analyses are adjusted for age, gender, height and packyears. Homozygote mutant (GG) individuals for rs212093 had a significantly lower number of plasma cells (-0.72 (-1.27 to -0.18); p = 0.01), neutrophils (-0.63 (-1.16 to -0.09); p = 0.02) and macrophages (-0.61(-1.07 to -0.15); p = 0.01) in bronchial biopsies than wild type (AA) individuals (Figures 2a, b and 2c, respectively). Individuals who were heterozygote (AG) for rs212093 had lower numbers of mast cells than wild type (AA) individuals (-0.25 (-0.47 to -0.03); p = 0.02) (Figure 2d). Estimated effects of MRP1 genotypes on inflammatory cells in bronchial biopsies of COPD patients. 2a: Number of plasma cells according to rs212093 genotype. 2b: Number of neutrophils according to rs212093 genotype. 2c: Number of mast cells according to rs212093 genotype. 2d: Number of macrophages according to for rs212093 genotype. 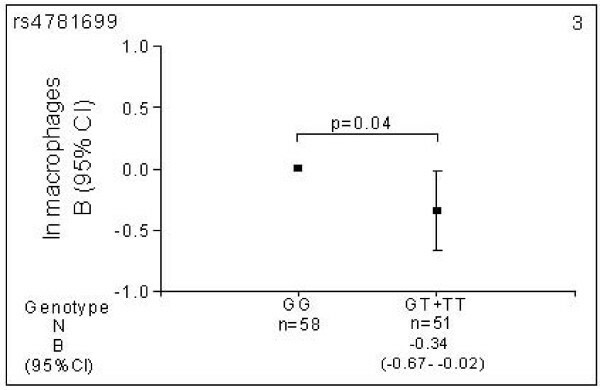 Minor allele carriers (GT/TT) for rs4781699 had significantly lower numbers of macrophages (-0.34 (-0.67 to -0.02); p = 0.04) than wild type (GG) individuals (Figure 3). Estimated effects of MRP1 genotypes on inflammatory cells in bronchial biopsies of COPD patients. Number of macrophages according to rs4781699 genotype. N = number of individuals. Data are presented as natural logarithm of each type of cells in bronchial biopsies. Different numbers for the SNP genotypes are due to missing data on genotype or inflammatory cells. Squares represent the regression coefficient (B) and vertical bars the 95% confidence interval (CI). Wild type was set to zero as the reference category. The analyses are adjusted for age, gender and packyears. The genotypes for the other two SNPs (rs4148382 and rs35621) were not significantly associated with any of the inflammatory cells in the bronchial biopsies. Heterozygote (GA) individuals for rs4148382 had a significantly higher total cell count (0.59 (0.11 to 1.07) p = 0.01) and neutrophils (0.61 (0.06 to 1.16); p = 0.03) in sputum compared to wild type (GG) individuals. None of the other SNPs was significantly associated with inflammatory cells in sputum. Additional adjustment for current smoking status did not change the size or significance of the effect estimates of the genotypes on inflammatory cells in bronchial biopsies and in induced sputum. Detailed data on the MRP1 genotypes and inflammatory cells in bronchial biopsies and induced sputum are presented in the Additional file 1. There were no significant differences in MRP1 protein levels between COPD patients and controls. 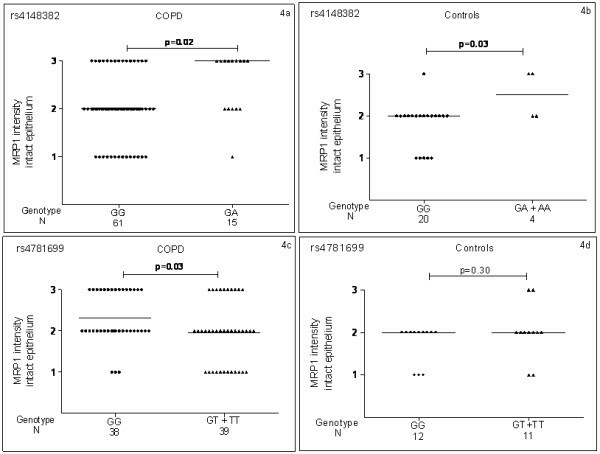 Heterozygote (GA) individuals for rs4148382 had a significantly higher MRP1 protein level than wild type (GG) individuals in COPD patients (p = 0.026) (Figure 4a) and in the control group minor allele carriers (GA/AA) for rs4148382 had a significantly higher MRP1 protein level than wild type (GG) individuals (p = 0.037) (Figure 4b). MRP1 SNPs and MRP1 protein levels of COPD patients and controls. 4a: MRP1 protein levels according to rs4148382 genotype in COPD patients. 4b: MRP1 protein levels according to rs4148382 genotype in controls. 4c: MRP1 protein levels according to rs4781699 genotype in COPD patients. 4d: MRP1 protein levels according to rs4781699 genotype in controls. N= number of individuals. 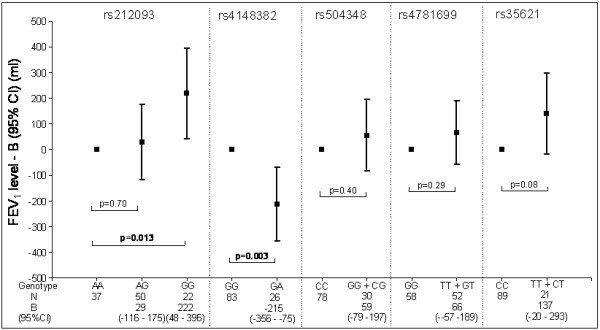 Minor allele carriers (GT/TT) for rs4781699 had significantly lower MRP1 protein level than wild type (GG) individuals in COPD patients (p = 0.036) (Figure 4c), but there was no significant difference in MRP1 protein level in the control group (Figure 4d). None of the other 3 SNPs (rs212093, rs504348 and rs35621) associated significantly with MRP1 protein levels. Levels of MRP1 were not related to lung function parameters, inflammatory cells in bronchial biopsies or number of packyears. This is the first study linking MRP1 SNPs with the severity of COPD and additionally with the intensity of MRP1 staining in bronchial biopsies. Our results suggest a role of MRP1 in COPD severity, as indicated by the associations of rs212093 genotypes with a higher level of FEV1 and less inflammatory cells in bronchial biopsies. Additionally, the SNPs rs504348 and rs4781699 were associated with less airway wall inflammation and rs4148382 with a lower FEV1 level and increased sputum cell numbers. Moreover, the before mentioned SNPs rs4148382 and rs4781699 were associated with respectively higher and lower levels of MRP1 protein in bronchial biopsies of COPD patients (see summary of the results in Figure 5). Summary of MRP1 SNPs' associations for COPD patients. FEV1 = forced expiratory volume in one second; MRP1 = multidrug resistance-associated protein-1; ↑ = positive association; ↓ = negative association; - = no association. Since first described in 1992 , a fair amount of data on the structure, substrate, function, and regulation of this transporter has been gathered. MRP1 is a member of the human ATP-binding cassette superfamily of transporters which regulates the traffic of molecules across cell membranes. The MRP1 pump confers resistance to several chemotherapeutic agents including vincristine, daunorubicin and methotrexate[20, 21]. In addition to protecting cells within the body against drugs, environmental toxins and heavy metals, MRP1 has been suggested to be involved in the cellular oxidative defence system and inflammation [22, 23], both being important in COPD development and progression. We showed that the MRP1 polymorphism rs212093 was significantly associated with a higher FEV1 level. In line with this, rs212093 SNP was associated with lower numbers of plasma cells, macrophages, neutrophils and mast cells in bronchial biopsies, cells implicated in COPD previously. Increased numbers of neutrophils have been reported in bronchial biopsies of smokers with airflow limitation, an increase that was associated with a lower FEV1. Neutrophils and macrophages release proteolytic enzymes and generate oxidants, which cause tissue damage as well as cytokines and chemokines that can potentiate inflammation and trigger an immune response. We previously reported a larger number of B lymphocytes in bronchial biopsies of patients with COPD than in controls without airflow limitation. Furthermore, epithelial cells of smokers with COPD contain higher macrophage and mast cell numbers than smokers without COPD. In a triple knock-out mouse model, we previously demonstrated that the inflammatory response to inhalation of cigarette smoke is reduced when MRP1 is absent. Linking previously reported increased airway wall inflammation in COPD with genetic variants of MRP1 we found rs212093 to be associated with lower numbers of inflammatory cells in bronchial biopsies, therefore, this SNP might play a protective role in COPD. This SNP located in 3'region is known to be in complete linkage disequilibrium with rs129081 located in the 3' untranslated region  and therefore this polymorphism might be involved in the regulation of MRP1 mRNA stability. One could raise the issue of multiple testing and that we should have adjusted for this in our analyses, but we feel that applying a sequential (classical) Bonferroni correction is not appropriate in the current dataset for a number of reasons. Firstly, our choice for the current study was explicitly driven by our previous findings, suggesting that there might be associations between MRP1 SNPs and COPD severity. Thus, we explicitly hypothesized on the main outcome variables on forehand. Secondly, a Bonferroni correction would not take into account the potential clustering of outcome variables, which might occur jointly at high or low levels, e.g. a Pearson's correlation coefficient r = 0.79 for macrophages and lymphocytes in induced sputum, or are defined as each others ratios. This suggests one might preferentially test a cluster of outcome variables as "one outcome variable" rather than test all variables separately. It has been shown previously that higher neutrophil percentages in induced sputum correlate with lower FEV1 levels , therefore it is of interest that rs4148382, located in 3'region of MRP1, is associated significantly with higher total cells counts and neutrophils in induced sputum and lower FEV1 level. The association with total cell counts might be driven by the neutrophils which represent 72% of the total cells in induced sputum. The functional consequence of this particular SNP is not known so far and it is not known whether any functional polymorphism is in linkage disequilibrium with it. This polymorphism is located closely to the 5'end of the MRP6 which maps also on chromosome 16. However, MRP6 mRNA is moderately present in human lung extracts  and highly expressed in the liver and kidney , which might suggest indeed that the effect of this particular SNP is within MRP1 and not MRP6. How this SNP functionally contributes to COPD severity has to be further unravelled in future studies. The observed effects in the current study appear to be opposite to previous findings in the same general population as described by Siedlinski et al. In the current study, which extends the previous findings, we observed that rs4148382 associated with a lower FEV1 level in COPD patients, whereas in the general population from the Doetinchem study rs4148382 associated with a higher FEV1 level . With respect to these findings it is worth mentioning that the present study was not designed to compare the direction or magnitude of effect estimates between the COPD patients and general population with respect to FEV1 and genetic factors. The opposite effects are likely due to the fact that we selected a COPD subset of the Doetinchem general population for the current study by matching on the clinical characteristics age, number of packyears and FEV1/FVC<70%. Although both groups had almost the same number of packyears (median 25th - 75th percentile) (40 (34.1 - 48.7) vs. 41.8 (31.2 -54.7)), the matched COPD subset in the general population had a higher lung function (mean FEV1 % predicted (SD) = 79.7 (13.4)) than our current COPD patients (49.5 (8.8)). This suggests that the COPD subset of subjects from the Doetinchem study who, fulfilled the GOLD criteria of COPD, might be less susceptible to cigarette smoke and COPD development. Therefore, the patients included in the current study with established COPD were probably not comparable with the heavy smokers from the general population based control cohort (Doetinchem). Additionally, we have calculated the haplotypes of MRP1 and assessed the effects of these haplotypes on FEV1 level and inflammatory cells in bronchial biopsies and induced sputum. We observed that the effects of MRP1 haplotypes are due to the specific SNP constituting these haplotypes, and therefore didn't add new information. 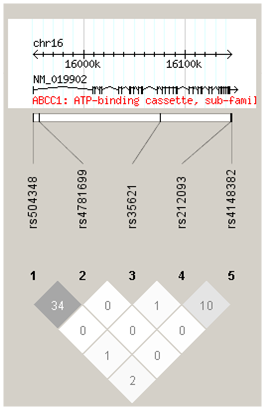 Details on the MRP1 haplotypes are presented in the Additional file 1. Decreased or increased functional MRP1 expression may have a high impact on development and/or progression of lung diseases and protection against air pollution and inhaled toxic compounds such as present in cigarette smoke[6, 7, 30]. One of our earlier studies showed that the MRP1 intensity in bronchial biopsies of COPD patients was lower compared to healthy individuals. How can we reconcile this with our current findings of MRP1 staining in COPD patients and controls? One option is that this might be due to differences in staining between paraffin and frozen biopsies. More important, it might be due to underlying differences of MRP1 genotyping distribution in the two populations. It appeared that the previous low intensity of MRP1 staining was driven by wild type individuals  and if we would have known this at that time, it might have had a different impact on the interpretation of the results. MRP1 is an essential pump for glutathione (GSH) - conjugates such as the inflammatory mediator leukotriene C4 (LTC4) as well as substrates in the presence of GSH (i.e. glutathione disulphide, GSSG) , thereby decreasing intracellular concentrations of toxic compounds. Given the rarity of homozygote mutant (AA) individuals for rs4148382 all the conclusions about this SNP are drawn based on the heterozygote (GA) individuals in COPD patients. It might be that in particular individuals who are heterozygote for rs4148382 SNP can have a locally high MRP1 protein level which therefore might lead to more severe inflammation at that site. Clearly, further research needs to investigate this approach in a larger sample of subjects with or without COPD. In conclusion, our study is the first to demonstrate that MRP1 plays a role in COPD severity, given the association of polymorphisms in MRP1 with airway wall inflammation, the level of lung function and moreover MRP1 protein levels in subjects with established COPD. This is an important step forward linking MRP1 polymorphisms with the pathophysiology of COPD. Members of the GLUCOLD Study Group: HF Kauffman, D de Reus, Department of Allergology; HM Boezen, DF Jansen, JM Vonk, Department of Epidemiology; MDW Barentsen, W Timens, M Zeinstra-Smit, Department of Pathology; AJ Luteijn, T van der Molen, G ter Veen, Department of General Practice; MME Gosman, NHT ten Hacken, HAM Kerstjens, MS van Maaren, DS Postma, CA Veltman, A Verbokkem, I Verhage, HK Vink-Kloosters, Department of Pulmonology; Groningen University Medical Center, Groningen, The Netherlands; JB Snoeck-Stroband, H Thiadens, Department. of General Practice; JK Sont, Department of Medical Decision Making; I Bajema, Department of Pathology; J Gast-Strookman, PS Hiemstra, K Janssen, TS Lapperre, KF Rabe, A van Schadewijk, J Smit-Bakker, J Stolk, ACJA Tire', H van der Veen, MME Wijffels and LNA Willems, Department of Pulmonology; Leiden University Medical Center, Leiden, The Netherlands; PJ Sterk, Department of Medical Centre, Amsterdam, The Netherlands, T Mauad, University of Sao Paulo, Sao Paulo, Brazil. SEB wrote the manuscript. SEB, JMV, and HMB analyzed the data. DSP, PSH, JMV, HMB designed the GLUCOLD cohort study. JMV managed the data. HAS designed the Doetinchem cohort study and managed the data. SEB, DSP, MS, JMV, WT, HMB interpreted the data. SEB and BR performed immunohistochemistry. SEB and WT interpreted the results of the immunohistochemistry. All authors proposed corrections and approved the final version of the manuscript.